Annapolis, MD–The Maryland Senate voted 35-10 for a state-wide fracking ban late Monday. The state legislation marks a turning point against oil and gas industry plans to build fracking wells and feeder pipelines across Maryland. The vote came ten days after Republican Governor Larry Hogan came out opposed to the fossil energy extraction process. The Maryland Legislature had enacted a three-year moratorium on fracking in 2014. But tonight’s vote enshrined the ban as a permanent major environmental victory. Maryland is the first state to legislatively ban the process. It joins New York which banned fracking by executive order in 2015, and Vermont which banned it in 2012. The vote is also a partial setback to the Dominion Cove Point liquid natural gas (LNG) export plant presently under construction in Lusby Maryland, according to Kelly Canavan, President of AMPS Creeks Council. “Nobody from the Maryland State Legislature or Dominion Resources is going to admit there was a connection between Maryland Fracking and Dominion Cove Point but I think that we know there was,” said Canavan. Canavan was “a ball of emotion” over the result of the vote and “incredibly inspired” by the work of many environmentalists who helped make the vote reality. 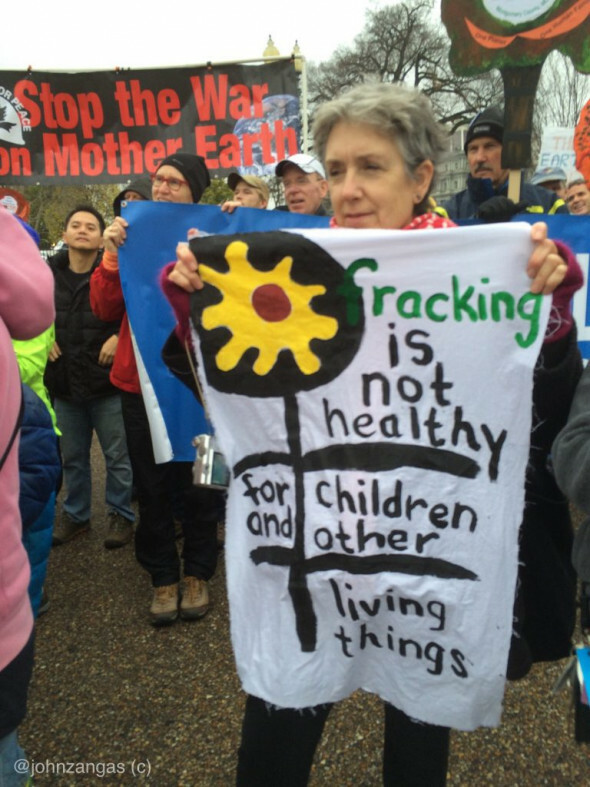 She had worked since 2009, leafleting, calling state legislators, testifying, and working in community outreach, to stop fracking in Maryland. Dominion Resources has been counting on excess gas production in Maryland to support its future contracts to ship domestic fracked gas to Asia. 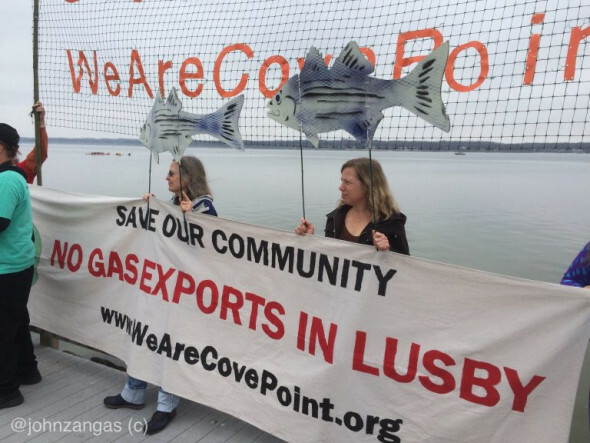 Groups like AMPS Creek Council, We Are Cove Point, and Calvert Citizens for a Healthy Community are among many groups that have been battling fracking in Maryland and Dominion Resources over construction of its Cove Point LNG plant since 2014. Fracking, which is short for hydraulic fracturing, is an extreme fossil energy extraction method in which over 200 chemicals and compounds are injected under high temperature and pressure through a wellhead and into shale coal deposits deep underground. The process yields fracked methane gas which must be transported by pipeline for distribution. Fracking also produces millions of gallons of polluted wastewater with each well bore, which the industry refers to as brine. The wastewater is too toxic for release or reuse so the industry practice is to re-inject it back into the earth, in effect burying the water and its toxic poisons. This controversial process has been linked to water and air pollution. It is also a hot trigger for ongoing environmental concerns over climate change and global warming. Some scientists have also connected wastewater injection to earthquakes in states such as Oklahoma and Texas where the oil and gas industry has drilled thousands of wells. The Marcellus shale belt extends from Canada through New York, northern and western Pennsylvania, western New Jersey, eastern Ohio, through western Maryland, and throughout most of West Virginia. It also reaches under the edges of western Virginia, east Kentucky and Tennessee. Fracking is widely used in Pennsylvania where over 7,700 wells have been drilled. It has resulted in “sacrifice zones” where communities have suffered from the effects of methane in drinking water, farmland rendered unusable, and families forced to move. I’m so jealous. This can never happen here; the best we can do in WV is serve as a bad example so more well-heeled places like Maryland, places where some people matter, can be wise enough to say no. And maybe we can stop the pipelines running OUR gas to Maryland (and Virginia and Ohio and Michigan and the Gulf)…but I really don’t see how. Never say never. People said that about abolishing slavery, giving women the vote and ending aparthied. People are waking up to the dangers of fracking so be inspired by this victory, learn from them and help to organise the resistance in your state. The winds of change are blowing we all just need to act!